Over the last few years there has been an enormous growth in interest in preserving our natural environments. They are under threat from multiple directions, with everything from climate change and logging to too many visitors threatening the great natural areas of this country. In some areas there has been an additional threat – garden plants that are not native to America have escaped into natural environments, especially near cities, and these can spread and make life more difficult for native species. This threat from ‘alien species’ is taken very seriously, and with the rapid communication of social media certain plants have become ‘the enemy’ very quickly. One plant that has been on the radar as an alien species for some years now is the Butterfly Bush, called Buddleja or Buddleia by botanists. This old-fashioned garden plant is loved by many, both for the beauty and bright coloring of its large flowers, and for the butterflies and other insects it attracts to your garden – to the delight of children. Many people have fond memories of summers at grandma’s, gazing at those beautiful insects fluttering around her butterfly bush, and want to re-create those memories for their own children and grandchildren. As well, this is a very easy plant to grow, thriving in hot, sunny spots, with dry soil, where growing other plants is hard. Then there is the long blooming period, from mid-summer to the first frost, which is amazing for such an easy to grow plant. The basic problem with the butterfly bush is that it produces lots of seed, which is easily spread into surrounding areas. In some cities these plants are common on waste ground and around abandoned buildings, and they have also spread into completely natural areas, along the edges of woodlands for example. Environmental activists in some states have campaigned successfully to have these plants banned – most successfully in Oregon and Washington state – so that they cannot be sold. Most people are responsive to their environmental responsibilities, and we all want simple answers, so many gardeners have simply stopped growing this plant. But wait – there must be more to this, because no less an organization than the North American Butterfly Association, a group dedicated to preserving butterflies, and whose members across the country create butterfly gardens, published a special issue in 2014, where some members put another side to this. In particular, Alan Branhagen, the Executive Director of Horticulture at the Kansas City Botanical Garden, studied the spread of Buddleja for 15 years, and found that, yes, it does spread into areas of abandoned ground, but he never saw it growing in any natural wild areas. And here is the thing – when most people see Nature, they see it from their car, or along a trail. Neither of these are natural, and they are sunny spots where Buddleja thrive – not deeper shady woodlands, where this plant is unlikely to flower at all. So are we getting a false picture? How real is the threat to un-touched natural spaces? The other thing to consider is where you live – location, location, location! The climate in Oregon, with its mild winters and plentiful rainfall for seeds to easily germinate, seems to be a place where this plant does spread. But what about in the Midwest, or North, where harsh winters typically kill this plant to the ground, and only in a garden, with pruning and care, can it be over-wintered at all? What about in drier states, where early heat in spring will shrivel a seedling in a day or two? In many areas there doesn’t actually seem to be a problem, so if you live in places like this, these plants, that provide season-long food for many the adults of many different species of butterflies, might better be seen as an asset, not a liability. In the end it seems that the question is, “On the ground, in your own garden, what should you do?” Fortunately, gardeners are an enterprising group, and once this problem surfaced they set to work to solve it. At the simplest level, there is a very easy solution. As the flowers on your butterfly bush fade, snip them off. Simple. That way no seed is produced, and no spread from your garden plant is possible. Plus, you stimulate more flower production, and actually help your bush to produce more blossoms – so a double benefit. This job does take a little time, but if you only have one or two bushes it really isn’t difficult. You have a window of a couple of weeks after flowering finishes on a spike before it is anywhere near producing seed, so it doesn’t have to be done every day. If this sounds too difficult, and you don’t have the time, there are still solutions. The older varieties of butterfly bush are simply selections of the original species collected in China, Buddleja davidii. They produce lots of seeds. 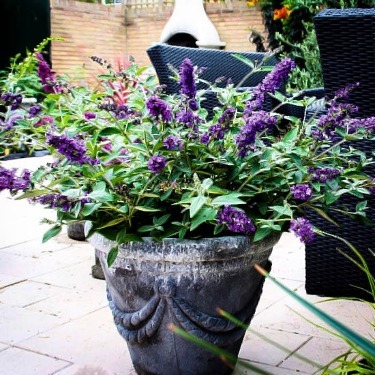 But gardeners love to breed plants, and some butterfly bush plants that are easily available, with big flowers and great colors, are hybrids – the result of breeding with another species. These produce very little if any seed, and even the state of Oregon – who have researched this issue extensively, because of their ban – have given the ‘stamp of approval’ to some hybrid varieties, specifically, ‘Miss Molly’, ‘Miss Ruby’, ‘Miss Violet’, and ‘Lilac Chip’. These can legally be sold and grown in Oregon, and of course that makes them good, safe choices for anywhere else too. Here at the Tree Center we take our environmental responsibilities seriously. 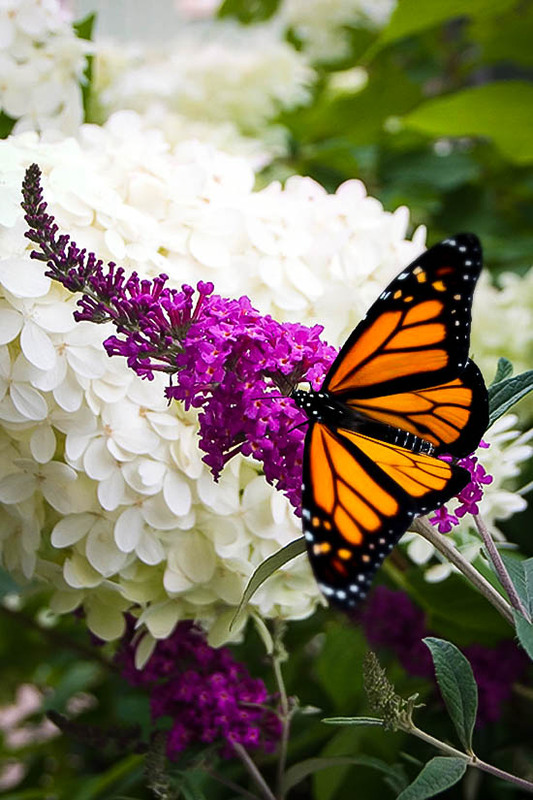 You will find plenty of beautiful butterfly bushes on our site, and most of them will be safe to grow even in Oregon and Washington – or anywhere else you want to be extra careful. When we do sell varieties that can produce seed, we assume that people who buy them either live in colder or drier areas, where these plants don’t pose a threat, or they are happy to carefully remove all the flowers once they fade, making it impossible for their plants to spread. Wherever you live, you can still grow this beautiful plant, and attract butterflies to your garden too, so enjoy them with a clear conscience. If you are still uncomfortable, then there are lots of other great summer flowering plants for hot, dry spots – crape myrtle bushes anyone?